Enriched with lime oil, cinnamon oil, avocado oil and green tea oil, this facial kit works well for wrinkles, age spots, sun burns, eczema and fine lines. It mitigates damage caused by free radicals and reduces likelihood of getting wrinkles, also has an antioxidant and antimicrobial properties. It is also extremely beneficial in the treatment of itchiness caused by dry skin and imparts instant radiance and prevents premature ageing. The facial kits are carefully formulated considering the nutrition requirement of different skin types that need specific products and treatments. The six-step facial treatment consists of cleansing, scrubbing, moisturising, hydrating, purifying and nourishing. These treatments are free from harmful paraben and chemical bleaching or whitening agents. 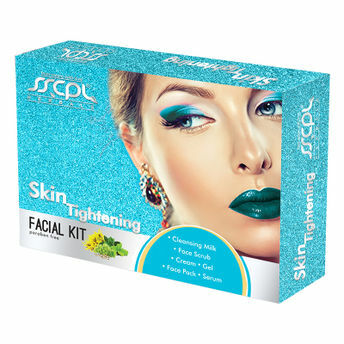 About the Brand: SSCPL Herbal India began its journey in 2002 with a clear understanding of the need to provide an all inclusive range of herbal products essential to look after the health, hygiene and beauty of every individual. The carefully formulated products are a combination of a precise study of the properties of various natural herbs and their beneficial effects. When given in apt proportions they help to address almost any and every type of skin problem. All of these products are made from 100% Veg. and Certified Organic Ingredients.